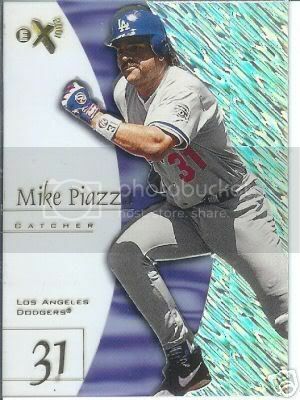 Does anyone remember way back in the late 1990s when companies tried to capture the idea of a futuristic baseball card? During this series, I will try to recapture some of these great sets in hopes of bringing some of you back to those days of collecting. The short lived, colorful cards from 1996-1998 were extremely popular among kids because of their “cool” backgrounds. In 1996, the cards had a background that appeared to be metal, volcanic, on another planet, or other random arrays of striking colors. The cards oftentimes had body parts of the players covered with metal armor as well. In 1997, the design of the cards didn’t change too much. The cards still had the same types of backgrounds and players would at times find themselves engulfed in the background. 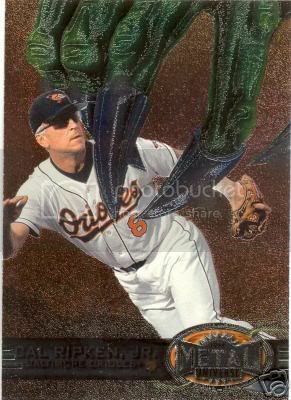 Some of my memorable 97 Metal Universe cards are Cal Ripken Jr. getting picked up by the claw and Wendall Magee Jr. chasing a fly ball into a cave. 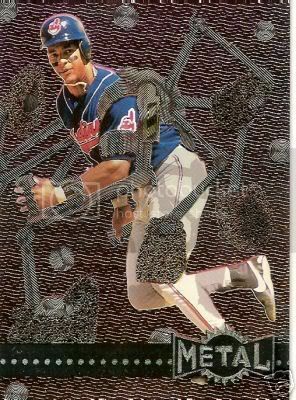 The downfall of Metal Universe started in 1998 when Fleer moved away from the futuristic backgrounds and used actual images instead. The cards became too real to be Metal Universe. Backgrounds of New York players featured the New York City skylines, some featured mountainous backgrounds, some had wild animals, and others had cars. Although, the Tony Womack card of him being chased by a plane did turn out for the good. There was still a small glimmer of hope that the futuristic theme would be continued as some cards had the players in front of a moon or planet in outer space. But, those dreams would only be crushed. But what was started in 1998 was finished in 1999 when Metal Universe became a low-quality standard set with no pizzazz or flare. The 1999 version of Metal Universe emphasized the metal instead of the universe. The nameplates on the cards appeared as if they were screwed into the card, which was a good idea, but the allure of Metal Universe was the backgrounds not the nameplates. 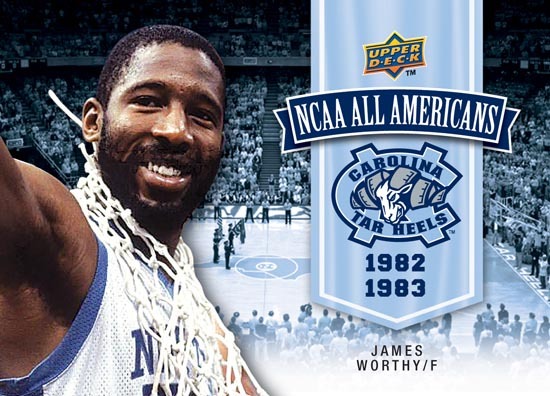 The background were a grainy silver superimposed over the actual background of the player photo. It was a sad end to some of the best cards of the late 1990s. Fleer again hit the spot of futuristic baseball cards with their EX series. It began in 1995 as Emotion, but that name was short lived as it became Emotion-XL in 1996 and EX-2000 in 1997, EX-2001 in 1998, EX Century in 1999, and finally settling on EX for 2000-2004. 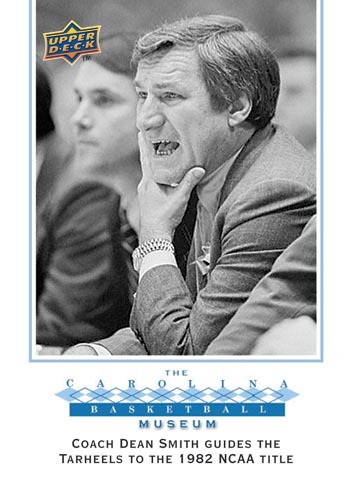 And while this set has a nice run into the 2000s, the idea of in the 1990s was far greater. In 1997, EX was the one set that eluded me. I finally stumbled across a Nomar Garciaparra EX card for a sample and I was overjoyed (calm down, I was 12). 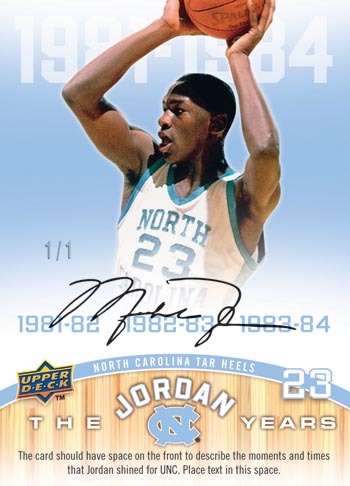 The cards had a thick colored border with the player’s name in gold across the bottom. The image of the card was where the intrigue was though. The player was die-cut out of the image and placed on a transparent background (the Murray card above shows this well). And when you flipped the card over, the player’s image was reversed. The idea of die-cut player images stuck around in 1998, but the transparent background wasn’t as lucky. However, that element was replaced by a clear background on the left side of the card and a rainbow effect on the right side with a colored strip in the middle. The 1997 version of the set was a better design, but I think that the three types of backgrounds gave the 1998s a better futuristic feel. 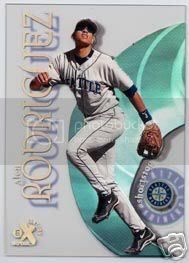 I think everyone remembers this Alex Rodriguez card as the picture in Beckett for 1999 EX Century. 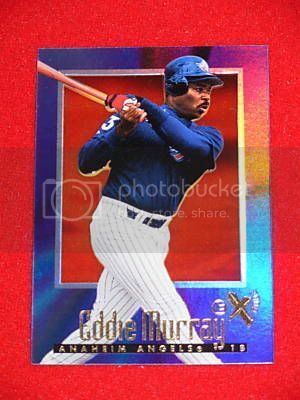 That year, Fleer unveiled the nicest design of the EX series. The players remained die-cut, but the background again changed for the better. The background is all clear except for a wave of color behind the player. Because the name is in the clear section, it gives a unique view from both sides of the card. 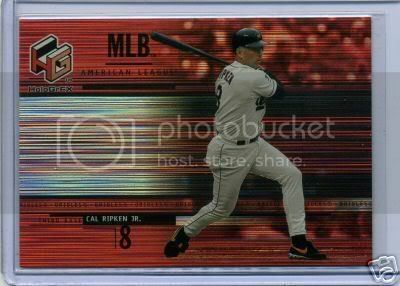 From 2000-2004, Fleer abandoned the transparent backgrounds and went with an array of colors which really took away from the EX feel. The cards were still of high quality in that era, but they just didn’t have the futuristic feel that I think was intended for them. 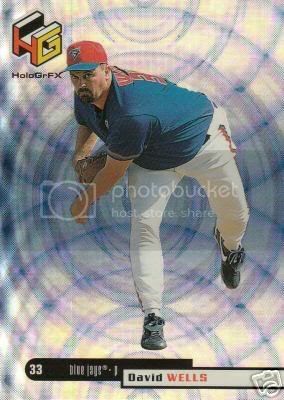 While not their first futuristic set, Upper Deck again joined the party in 1999 with thier release of Upper Deck HoloGrFX. The 1999 version of the set was vibrant in color, and the company carefully utilized the team colors into the matrix backgrounds. The top and bottom of each card featured a silver and rainbow background while the middle featured rings with the team’s colors. The design of HoloGrFX changed dramatically in 2000 as the cards went from vertical to horizontal and the backgrounds changed completely. 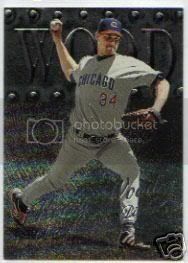 The right half of the 2000 cards features a picture of the player blurred out by the streaking lines of the right side background. In the middle of the right side, there is silver rainbow section with colored streaking lines striking over it. The lines are more vibrant in the middle of the card and fade out as they move up and down. As I said before, there will be more of these articles coming. In the end, I would like to have a vote to see what people’s favorite futuristic style sets are. If it goes well, perhaps I will focus on other theme based sets from other eras. Thanks and I hope you enjoyed this one tank trip down memory lane. Print article This entry was posted by intelliracer on March 16, 2008 at 7:33 pm, and is filed under MLB. Follow any responses to this post through RSS 2.0. You can leave a response or trackback from your own site.